Airspeed Oxford, IWM, Duxford – a ‘plane with literary connections! | Shortfinals - aviation and more! 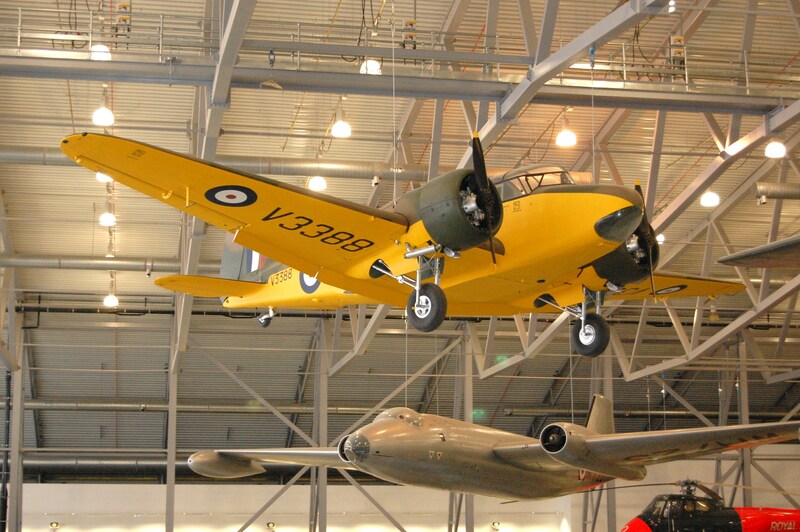 Airspeed Oxford, IWM, Duxford – a ‘plane with literary connections! The Airspeed AS.10 Oxford is one of those aircraft that undoubtedly helped to win the Second World War. No, unlike its contemporary, the Avro Anson, (see earlier blog entries) which was also developed from a small airliner and powered by two Armstrong-Siddley Cheetah radial engines, it didn’t have any dogfights with Me109s. Instead, the Oxford grew to be the backbone of the Training Command of the Royal Air Force, and a major component of the British Commonwealth Air Training Plan (sometimes called the Empire Air Training Scheme). Airspeed Ltd was founded by Neville Shute Norway in 1931. N.S. Norway had trained as an aeronautical engineer, and worked under Barnes Wallis (of ‘Bouncing Bomb’ fame) at Vickers Ltd. on the successful R.100 airship. His first design for the new company was the Airspeed A.S.6 Envoy, a ‘feeder liner’ as we would say, carrying 8 passengers; he was responsible for devising a retractable undercarriage for the Envoy, and it enjoyed both civil and military success – an Envoy served in ‘The King’s Flight’, and was used to convey members of the Royal Family, and the South African Air Force ordered a batch of seven ‘Convertible Envoys’ which could be fitted with an Armstrong Whitworth gun turret and carriers for small bombs, as needed. It was natural, therefore, that the basic Envoy design would be adopted as the RAF’s first twin-engined trainer with retractable undercarriage; the new bombers such as the Whitley, Wellington and Hampden would need large, specialized crews, and this meant a whole new training scheme. Built to Specification T.23/36 and named ‘Oxford’, the new aircraft first flew 19th June, 1937 (the RAF gave its trainers names associated with education, e.g. Magister, Harvard, Don). Just before the outbreak of WW2, Neville Shute Norway left Airspeed (and his position as Managing Director) to concentrate on his writing career – his pen-name was, of course, Neville Shute. On the outbreak of war, he joined the Royal Navy Volunteer Reserve; by the end of 1945, he retired as a Lieutenant Commander, having worked on secret weapons for the Directorate of Miscellaneous Weapons Development. The Oxford (or ‘Oxbox’ as it was affectionately know), was built by Airspeed (4,960), De Havilland (1,515), Percival Aircraft (1,525) and the Standard Motor Group (750) during WW2. It was capable of training pilots, navigators, air gunners, radio operators and flight engineers. As well as equipping service flying schools in Great Britain, they spread out all over the globe, training aircrew in Australia, New Zealand, South Africa, Canada, and Southern Rhodesia. Nearly 50% of all aircrew who served in the RAF, RCAF, RAAF and RNZAF went through the British Commonwealth Air Training Plan, and although it is difficult to quantify how many were trained on Oxfords, it was a substantial amount. The Oxford Mk.1 had been equipped with a gun turret; this was dispensed with in the Mk.II (a pilot trainer). The last major variant was the Mk.V, which was equipped with 2 x 450 hp Pratt & Whitney Wasp Junior radials. This variant was used mostly in Canada and Southern Rhodesia. As well as training duties, Oxfords were fitted out as air ambulances and used by station flights and other units on communication duties. Another necessary, if rather dull, task was use by anti-aircraft co-operation squadrons. Sadly, the great aviatrix Amy Johnson was lost after bailing out from an Oxford she was ferrying for the Air Transport Auxiliary over the Thames Estuary, on 5th January, 1941. Just as with the De Havilland Dominie and Avro Anson, a few Oxfords were supplied to USAAC units under Reverse Lend-Lease. Here we see the Imperial War Museum’s superb Oxford Mk.1 (2 x Armstrong-Siddley Cheetah IX of 355 hp) suspended from the roof of ‘AirSpace’ at Duxford. Built in 1940, by the Standard Motor Group, as ‘V3388’ (c/n 3083), she was used post-war by Boulton Paul Aircraft Ltd. ‘V3388’ was put on the British Civil Register as G-AHTW, and ended up with the amazing ‘Skyfame Collection’ at Gloucester/Staverton Airport (ICAO: EGBJ) in 1964, where I first saw her. Acquired by the IWM, a two-year restoration was finished in March 2006, and ‘V3388’ is displayed to advantage in ‘AirSpace’. The Oxford was, however, to see ‘glory in combat’. During the Rashid Ali revolt in Iraq, in May 1941, Oxfords from No 4 Service Flying Training School which was based at RAF Habbaniya were used as light bombers to attack Iraqi troops surrounding the base. After 5 days of hard fighting, the 27 Oxfords on strength had been reduced to four ‘flyers’, but along with numerous Hawker Ajax (also part of 4 SFTS) and Vickers Wellingtons flying in from Basra, they had broken the back of the revolt with a series of almost non-stop ground attack sorties. Truly, this was the Oxford’s moment in the sun. The Oxford might not be the first WW2 aircraft you think of, but it played a substantial role in ensuring victory, thanks to the thousands of aircrew trained in many countries. Ross, I think a nod is owed in the direction of Airspeed, Ltd’s co-founder and the Oxford‘s principal designer, A. Hessell Tiltman. Tiltman and Norway found themselves “redundant” when the R.100 project shut down after the R.101 disaster, and they started their own airplane company, Airspeed – a pretty brave thing to do in 1931. N.S.N.’s autobiography, Slide Rule is the canonical source. Absolutely! Thank you for this, you are quite correct when it comes to the role of Tiltman. I saw that Tiltman and Norway were listed as co-designer’s of the AS.6 Envoy, but space considerations (I was already over 700 words) prevented me from giving as much detail as I would have liked. I would have loved to featured the R.100 vs. R.101 argument (as laid out in ‘Slide Rule’) but we would have ended up with a 1,000 words plus, at that point. Once again, thank you for your cogent comments! Just to complete the picture, the Envoy/Oxford was actually Tiltman’s fourth design for the new Airspeed company. First, was a high performance glider followed by the three-engined Ferry biplane (for Alan Cobham), then the single engined Courier. The Envoy came next and was really a twin-engined development of the Courier. Later, Tiltman designed the Airspeed Horsa troop carrying glider.